Pop quiz: When was the last time you scanned a multipage document into a PDF on your home printer/scanner and then realized the file size was too large to use? It happens to me at least once a month… I find it’s often a problem when you want to upload the PDF online, and there are upload file limits. Okay… so you just have to compress the file. No problem… right? In the Apple ecosystem, I’ve found the native PDF compression solution remarkably… unintuitive. And then save as you normally would. Yes… but the new file that gets created looks… terrible… barely readable. Sure the file is certainly compressed, but if there’s any small text to read, it’s mostly unrecognizable. 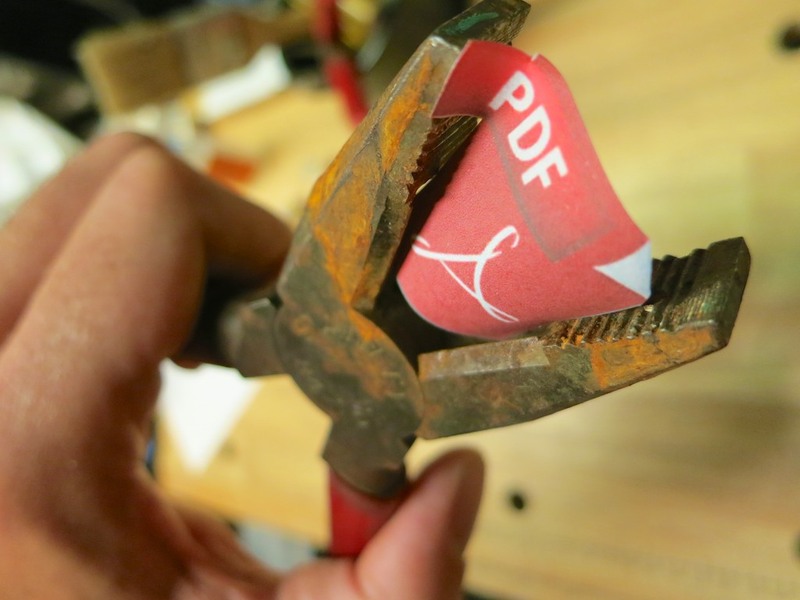 That’s right… you’re going to ‘print’ your PDF into a compressed file. On the bottom left of the ‘Print’ menu, you’ll see a PDF drop-down box. Then save as you normally would. This method creates a larger compressed file than the ‘Export’ route, and as it turns out… the resulting file looks really good. So if the new PDF is small enough for your needs… you’re done. For the record, this ‘Print’ method took a 5.7MB five-page PDF down to 1.5MB. If you think using Adobe Reader can help you, don’t bother. You’ve got to pay Adobe to help you with compression. As it turns out, there are other third-party solutions… and some are free. But I’m not interested in MacGyvering this problem. I’m intentionally limiting today’s exercise to the native software that’s already living on my otherwise wonderful Mac. The trick is to create a new compression profile using your native ‘ColorSync’ utility. You can duplicate Apple’s standard ‘Reduce File Size’ filter there and easily tinker with the settings of your new filter. Open ‘ColorSync Utility,’ which typically lives in Applications/Utilities. When you open up ‘Image Sampling’ and ‘Image Compression,’ you’ll see the main profile is all locked up. This is the step that creates your own personal filter copy. Now you can monkey around to your heart’s content! I increased ‘Scale’ from 50% to 75%. Then, I increased ‘Max Pixels’ from 512 to 1280. Voilà… you’ve just created your own custom Quartz filter! Next, simply open up your original PDF with ColorSync. Go to the bottom left drop-down ‘Filter’ menu. Select your new custom filter. Save as you normally would. And that’s all I really needed! So there you have it… two prefab methods and a hidden path to cook up your own compression settings in the OS X environment. It’s worth noting that much of the online chatter on this topic is years old… so I’m a little late to the party… But on the other hand, what average person is supposed to have this kind of detail readily accessible at their fingertips? In an age where your computer is getting smarter by the minute, shouldn’t a simple compress command with several size settings be readily accessible?